This is a great map of South America for students, schools, homes or offices. It shows the countries of Africa in great detail along with their boundaries, important cities, major transportation features, lakes, rivers, mountains, deserts and other cultural and physical features. It is large, colorful, beautiful, and its lamination makes a durable map. You can write on it with dry-erase markers and wipe them off when finished. Post-It notes make great markers that cleanly remove when you are finished. Plan or share your trip to South America on this map! Use pins or removable tape to attach photos, tickets, notes, signs, flags and more. One of the most valuable uses of a map like this is in the home. 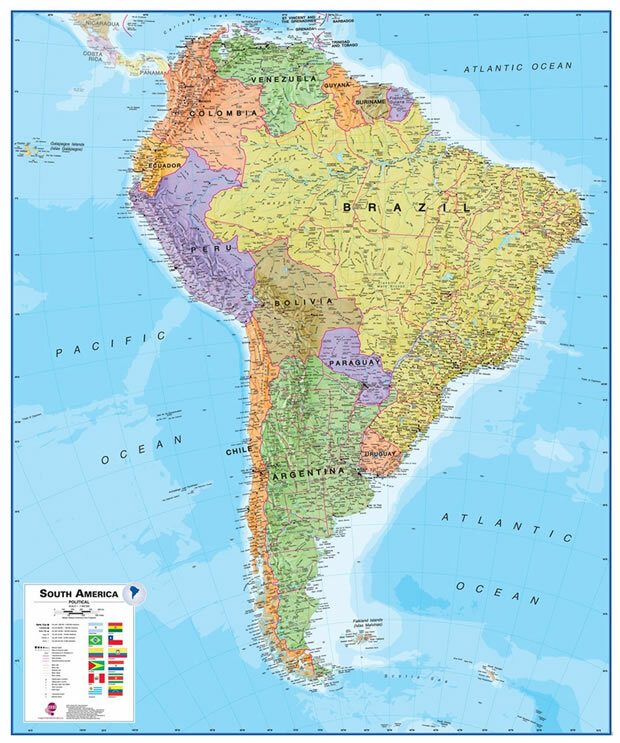 When you learn about an important event in South America while watching the news or reading a news website, you can find the location on the map. This will enrich your understanding of the event and your knowledge of South American geography. This is a great map for those who are home schooling. A total of twelve South American countries are shown on the map. They include: Argentina, Bolivia, Brazil, Chile, Colombia, Ecuador, Guyana, Paraguay, Peru, Suriname, Uruguay and Venezuela.